Uloma Owunta, RT(R), Clinical Instructor, Emory Saint Joseph’s Hospital. Uloma Owunta was born in New Orleans, Louisiana and has lived in Atlanta for nearly the past 12 years. She graduated from West Georgia Technical College with an Associate Degree in Applied Science in Radiologic Science in 2011. She went on to advance her education by joining the RT-BMsc Medical Imaging Bridge Program at Emory University and graduated with honors with her Bachelor’s in Medical Sciences in 2012. 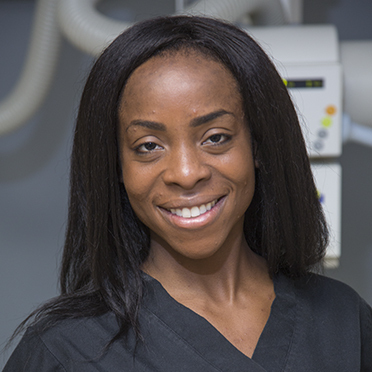 Prior to her career in Radiology, Uloma worked at Pizza Hut as a manager, and as a teller at SunTrust bank. Uloma was fortunate enough to obtain a full-time position with Children's Healthcare of Atlanta at Scottish Rite Hospital immediately after graduating from her radiography program in 2012, and landed a Practing Registered Nurse (PRN) position with Emory Saint Joseph’s Hospital in the same year. However, she is now a full-time day shift technologist at Emory Saint Joseph’s Hospital as of May 2014 while maintaining a PRN position with Children’s Healthcare of Atlanta. Outside of work, Uloma loves health, fitness and overall wellness. She is a wellness coach and she also participates in boxing and crossfit. In the Spring semester of 2015, the Emory Medical Imaging Program started rotating students through Emory Saint Joseph’s Hospital. As the clinical instructor at Emory Saint Joseph’s Hospital, Uloma enjoys interacting with all the medical imaging students. She appreciates the collaboration among the clinical staff, students, administration and Emory instructors that helps facilitate student learning. When asked to give her best advice to our Medical Imaging students, she replied by saying “The imaging community is a close knit network and a good or bad impression may stick with you for the duration of your imaging career. Put your best foot forward and strive to improve each day”. Thank you, Uloma, for being one of our clinical instructors. We appreciate all your hard work and dedication to our students’ learning experience.